High blood pressure is the most common condition associated with Branch Retinal Vein Occlusion (BRVO). Most of us are aware that high blood pressure and other vascular diseases pose risks to overall health, but many may not know that high blood pressure can affect vision by damaging vessels in the retina. High blood pressure is the most common condition associated with Branch Retinal Vein Occlusion (BRVO). About 10 to 12 percent of the people who have BRVO also have glaucoma (high pressure in the eye). A branch retinal vein occlusion is the blockage of veins in the retina, the layer of light-sensing cells at the back of the eye, leading to back flow of blood and fluid into the retina. If the blocked retinal veins are ones that nourish the macula, the part of the retina responsible for reading, central vision is lost. During the course of vein occlusion, sixty percent of people will have swelling of the macula. In about one third of people, this macular swelling (edema) will remain for over a year without treatment. BRVO causes a painless decrease in vision, resulting in misty, distorted, or blotchy vision. If the blocked veins cover a large area, new abnormal vessels may grow on the retinal surface, which can break and cause worsening vision. Your retina specialist may recommend a period of observation, since blood and excess fluid may subside. If the central retina is involved or abnormal blood vessels develop, your retina specialist will direct treatment to help recover and protect vision. Your eye care specialist will also order studies to identify the cause of the blockage in order to minimize the risk of a second event in the eye or elsewhere. 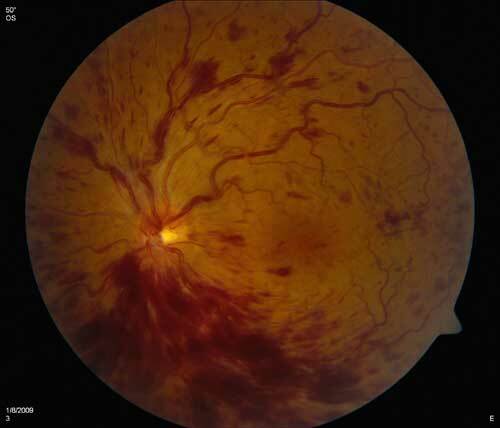 If you have had a branch retinal vein occlusion, regular visits to your eye doctor are essential to protect vision. Central retinal vein occlusion (CRVO) blocks the main vein in the retina, the light-sensitive nerve layer at the back of the eye. The blockage causes the walls of the vein to leak blood and excess fluid into the retina. When this fluid collects in the macula, the vision becomes blurry. Blotchy vision, intermittent loss of vision, and new floaters, are other symptoms of CRVO. When retinal blood vessels are not working properly, the retina grows new fragile vessels that leak blood into the vitreous, the fluid that fills the center of the eye. Blood in the vitreous is seen as tiny dark spots, or floaters, in the field of vision. 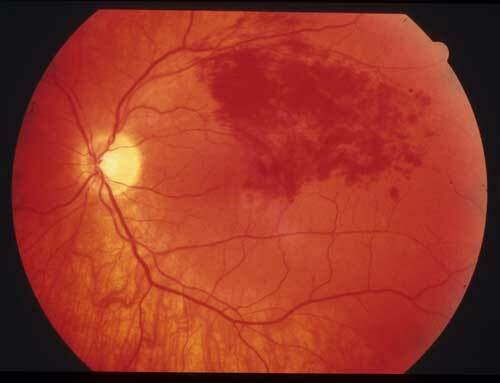 Retinal vein occlusions commonly occur with glaucoma, diabetes, vascular disease, high blood pressure, and blood disorders. Sometimes they occur because of blood vessel changes in the eye. Your eye doctor will try to determine the cause of the CRVO and prescribe a treatment plan to salvage your vision. A number of treatments may be appropriate and can often reverse the disease process, restoring vision.